They were hidden a bit in her curly 'do (which seems to be a trend -- show us your earrings, royal ladies! 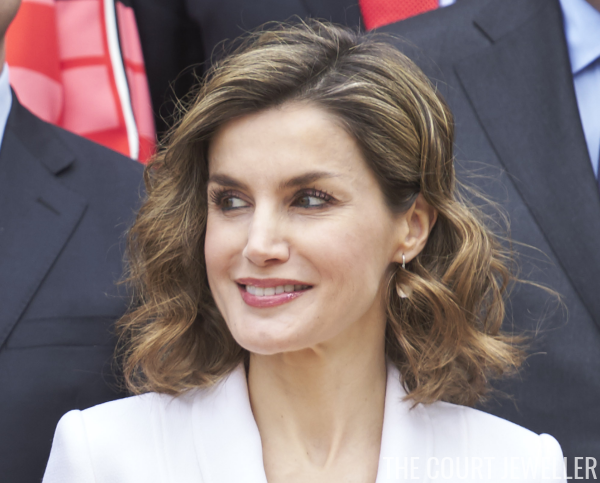 ), but Letizia wore her Tous cultured freshwater pearl drop earrings on Thursday. The event was a meeting at Zarzuela Palace for the Miguel de Cervantes IV Centenary. On Wednesday, Letizia attended a series of audiences at Zarzuela Palace. For those meetings, she selected a pair of stud earrings in an abstract floral pattern. Each floral earring is composed of five petals of varying lengths.